Ex-pat octogenarian Shirley Jaffe's exhibition is a satisfying delight on many levels. Presented as a kind of mini-retrospective, complete with a catalogue and short essay by Carolyn Lanchner, the show has seven recent works with six earlier works from the previous four decades. Forty years ago Jaffe was already forty-five years old and steering into what would prove to be her mature style. Jaffe moved to Paris in 1949 and spent the next decade exploring Abstract Expressionism before progressing, like many of her peers, to newer investigations of what a contemporary painting could be. By the mid-60s she had eliminated expressionistic brushwork and began looking at alternate ways of organizing the picture plane. The Gray Center, (1969) comes near the end of this fertile period of growth. Simultaneously lush and formal in equal extremes, it presents a large vertical grid made up of six rectangles – three on each side – with each rectangle composed of segmented triangles, squares, and ovals. Running from top to bottom in the visual center is the purported gray center of the title, although in actuality it is much closer to a putty blue-green than gray. Always the colorist, Jaffe slices into the upper right corner of the "gray" a section of burnt orange that sets the key for the entire work. The paint application, too, demonstrates the careful thoughtfulness and restraint that will only grow stronger and more self-assured in the years that follow. Not yet obvious is the artist's abundant humor or her eventual ease in manipulating shapes, although one might be able to intuit in the center stripe a sly wink at Barnett Newman. But if we are to throw about names, Stuart Davis and Matisse (in his late works) are more likely to resonate. Jaffe shares these painters' interest in a flat but highly fluid figure/ground relationship, as well as a truly remarkable ability to strip down everyday objects from the real world to their essentials while retaining a sense of their mystery. Perhaps offering an early hint at the artist's internal dialogue at this time is Macon, 1979. Ten years after The Gray Center, Jaffe has completely jettisoned the stiff grid and strict geometric shapes in favor of a loose, undeniably playful series of rectangles with interior forms. 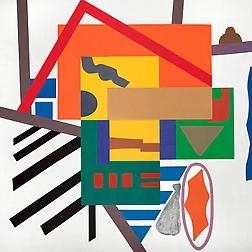 The forms, though abstract, clearly refer to things in the material world: an escutcheon pair float in the upper right next to what appears to be, just maybe, the Marlborough cigarettes logo. Below these forms and some others, the lower 60 percent of the painting presents a large green and white half oval surrounded by a gray ground (really gray this time) with calligraphic orange lines dancing all around. This gray ground is as fully realized as any of the prominent grounds in her later works, and one wonders whether Jaffe did not toy, therefore, with adopting this gray as the neutral space that would allow her to range freely through her pictorial ideas. Instead – for which perhaps we have the light in Paris to thank -- Jaffe made off-white her primary ground of choice, creating a seemingly limitless palette of sensuous, creamy variations from the most unassuming of colors to build upon. The simple forms she created and continues to use developed an internal language all their own, playful, vibrant, and familiar in a way that borders on the uncanny. It is abundantly clear that the artist's decisions over the last four decades were exceptionally good ones, right up to her most recent creation, the knock-out Labyrinth, 2009-10. This is a show not to miss.